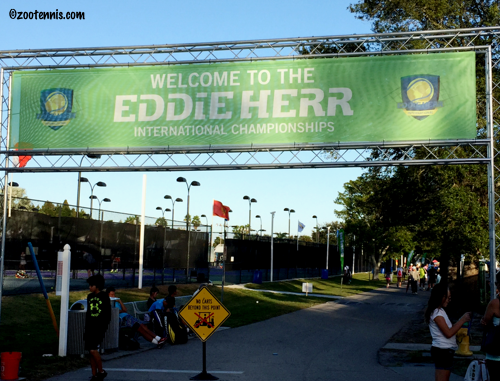 Eddie Herr ITF seeds received a warm welcome on Monday at the IMG Academy, with 25 of the 28 in action advancing to the second round. Top seed and defending champion Dalma Galfi of Hungary didn't need a wakeup call for her 7:45 a.m. start time, at least not in her match, as the US Open girls champion quickly took the first set from 14-year-old Yuki Naito and pulled away in the second set for a 6-1, 6-3 victory. Galfi gets another 14-year-old in the second round, Caty McNally, who defeated Nina Kruijer of the Netherlands 6-0, 6-2. US Open girls finalist and No. 2 seed Sonya Kenin, playing on the Academy Park courts, took out Peru's Dominique Schaefer 6-1, 6-1, but No. 3 seed and Australian Open girls champion Tereza Mihalikova of Slovakia had her hands full with Isolde De Jong of the Netherlands before posting a 4-6, 7-5, 6-4 victory. De Jong double faulted twice from 30-all serving at 4-5 to end what was until that stage an ultra competitive and well played match. Kenin plays 14-year-old Olga Danilovic of Serbia, while Mihalikova will play the winner of Tuesday's match between Kelly Chen and Ali Collins of Great Britain. The only girls seed to fall of the 13 playing Monday was No. 8 seed Pranjala Yadlapalli of India, who was defeated by Morgan Coppoc 7-6(1), 4-6, 6-3 in another lengthy match. Coppoc, who had played both tournaments in Mexico prior to the Eddie Herr, admitted that clay is not something she trains on much, but she can use her skills on it. "I'm from Oklahoma and we don't have a lot of clay, so I mostly play on hard courts, mostly indoor," said the 16-year-old from Tulsa, who has already committed to Georgia. "But I slide a lot on hard courts, so clay kind of fits my physicality." Coppoc had never played Yadlapalli, but she was anticipating a tough match. "I asked a friend who had played her for tips, and she said [Yadlapalli] hit really flat," Coppoc said. "So I tried to play it really heavy, get it above her strike zone. She hit a lot of great shots, and in the second set, she wasn't missing many backhands. Her forehand was her stronger shot, I felt, so I was keeping everything to her backhand, but in the second set she was getting used to it, making more, and I was also double faulting because I was getting tight and nervous. But in the third set, I just went out there and said, if I lose, I'm going to lose playing my game and I pulled it all together." Coppoc's opponent in Wednesday's second round will be lucky loser Taylor Russo, who defeated Maria Jose Portillo Ramirez of Mexico 6-1, 3-6, 6-1, in a match with many a Vamos and C'mon. Yucatan champion Kayla Day, the No. 9 seed, defeated 14-year-old Natasha Subhash 6-2, 6-4, overcoming a second set dip to win the final five games of the match. "I think I was a little bit fatigued in the second set," said Day, who didn't arrive in Bradenton until 8 p.m. Sunday night after playing the singles and doubles finals Saturday evening. "I got off to a really good start in the first set, but then it started wearing me down. My arm is definitely fatigued, but I was able to fight through it, just forget about it and get through this match, because I'll have a day off tomorrow." Day, who survived a bout of food poisoning in the early days of the Yucatan Cup, gave Subhash credit for forcing her to re-energize. "She was serving a lot better, making more first serves," Day said. "But I was hitting it shorter, so she was able to attack more. I wasn't on offense as much as I would have liked. But then I started serving better, and she started to make a few more errors, so that helped me." No. 7 seed Bianca Andreescu of Canada, who lost to Day in the Yucatan final, advanced to the second round with a 6-2, 6-1 win over Panna Udvardy of Hungary. Kenneth Raisma of Estonia, the No. 16 seed, was also a Yucatan finalist, and he too negotiated the quick turnaround, defeating wild card Nathan Perrone 6-2, 6-3. Perrone was one of a dozen US boys to lose in the first round, while only four recorded victories. Wild card Oliver Crawford held his own with top seed Casper Ruud of Norway, but suffered a break serving at 2-3 in the first, and couldn't find a way past the ITF's fifth-ranked player, who played well throughout the match. No. 2 seed Stefanos Tsitsipas of Greece, who won his first Futures title two weeks ago, looked exceptionally sharp in a 6-1, 6-1 win over Mwendwa Mbithi. One of the four US boys wins came from Vasil Kirkov, who took out No. 11 seed Youssef Hossam of Egypt, a finalist at the Grade A Abierto Juvenil Mexicano two weeks ago, 7-6(7), 6-4. Unfortunately, Kirkov will face another US boy in the second round Wednesday, Zeke Clark, who defeated Yshai Oliel of Israel 6-3, 6-4. The two seeded US boys also advanced, with No. 9 seed Nathan Ponwith beating Mattias Siimar of Estonia 6-2, 4-6, 6-1 and No. 12 seed Ulises Blanch defeating lucky loser Christos Antonopoulos of Greece 6-1, 7-6(0). Four US boys--JJ Wolf, Trent Bryde and qualifiers Adam Ambrozy and John McNally--play their first round matches on Tuesday. In addition to Coppoc, Russo, Day, McNally and Kenin, eight other US girls won their opening matches: Kylie McKenzie, Claire Liu, Abigail Desiatnikov, Kariann Pierre-Louis, Sofia Sewing, Michaela Gordon(11), Alexandra Sanford(15) and Abierto Juvenil Mexicano champion Amanda Anisimova. Eight more American girls will play first round matches Tuesday: Ingrid Neel(12), Kelly Chen, Ellie Douglas and qualifiers Victoria Emma, Jessica Livianu, Hanna Chang, Sabina Dadaciu and Meibel Chi. Doubles also begin on Tuesday, with Galfi and Mihalikova the top girls seeds, and Ruud and Miomir Kecmanovic of Serbia No. 1 in the boys draw. Draws and Tuesday's order of play can be found at eddieherr.com. The opening round in the top half of the 12s, 14s and 16s draws was completed Monday, with one top seed eliminated. Yeonwoo Ku of Korea defeated Girls 12s No. 1 Daria Lopatetska of Ukraine 6-2, 4-6, 6-1. The bottom half of the six draws will be played on Tuesday, with doubles starting on Wednesday. Results and Tuesday's match times can be found at the TennisLink site. The Har-Tru courts at the IMG Academy were busy from 7:45 a.m. until 5:45 p.m. Sunday, with the final match of two rounds of ITF qualifying ending after sunset. Five US girls and two US boys advanced to the main draw. 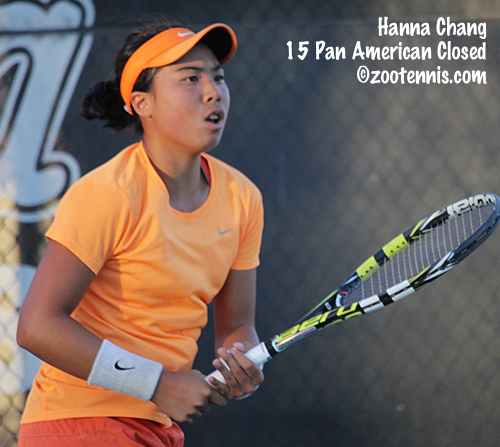 Top seed Hanna Chang, No. 15 seed Sabina Dadaciu, No. 4 seed Meible Chi, No. 10 seed Victoria Emma and No. 8 seed Jessica Livianu all advanced without dropping a set in either of their two matches. (Chi played only her final round qualifying after it was discovered late yesterday that her second round opponent had also played in the 16s qualifying, which is not permitted). In fact, only one qualifier played more than four sets on Sunday--No. 12 seed Nidhi Surapaneni of India, who needed three sets to get past her second round opponent Marlee Zein. No. 6 seed Violet Apisah of Australia and No. 7 seed Ali Collins of Great Britain also advanced to the main draw. Due to the withdrawals of Olesya Pervushina and Wimbledon girls champion Sofya Zhuk of Russia and Usue Arcondada, three lucky losers got in: Brindtha Ramasamy of Canada, Shelly Krolitzky of Israel and Taylor Russo. No. 1 seed Dalma Galfi of Hungary will begin the defense of her title on Monday against Yuki Naito of Japan, while No. 2 seed Sonya Kenin will play Dominique Schaefer of Peru. Kenin defeated Schaefer in two tiebreakers in the second round of the Grade 1 Yucatan Cup last week. In contrast to the girls qualifying, the final round of the boys qualifying was long and arduous for most. Six of the eight afternoon matches went the full three sets, with No. 15 seed Michiel De Krom and No. 6 seed Bart Stevens of the Netherlands, No. 9 seed Elliot Benchetrit of France, unseeded Nicolas Mejia of Colombia, unseeded Sebastian Baez of Argentina and unseeded John McNally all taken to the limit. McNally had the most dramatic win, defeating unseeded Kyrylo Tsygura 6-3, 4-6, 7-6(5) in the only all-American matchup in the final round of boys qualifying. Tsygura led 4-2 in the third set, but couldn't hold on to the break, and was broken at 5-all to give McNally an opportunity to serve for the match. McNally's first serve was not in evidence in that game however, and he failed to convert on two match points, the first lost to a double fault and the second to a forehand sent long. Tsygura got a minibreak to lead 4-1 in the tiebreaker, but after McNally won his two points on serve, Tsygura double faulted. A McNally forehand forced an error on the next point, putting the match on his racquet at 5-4 serving, but McNally's backhand error made it 5-all. Serving much better in the tiebreaker than he did in the previous game, McNally hit a good serve and forehand winner combo to reach match point, and converted it when Tsygura missed a backhand wide early in the final point. That was the last match of the day on the Academy Park courts, which have been expanded from 7 to 9 courts this year, but the day's final match ended in the fading light on Court 1. Baez defeated No. 16 seed Gerardo Penchyna Cardenas of Mexico 6-1, 5-7, 6-4 in that match, putting an end to a long day for the Mexican. Baez served for the match at 5-2, then again at 5-4, and finally ended it with a surprise serve and volley, perfectly executed. Penchyna Cardenas was on court approximately six hours Sunday, having won a nearly four-hour second round match over Gabriel Boscardin Dias of Brazil 1-6, 6-3, 7-6(2). The two boys who advanced to the main draw without drama were unseeded Adam Ambrozy and No. 1 seed Rudolf Molleker of Germany, who won both of their Sunday matches in straight sets. 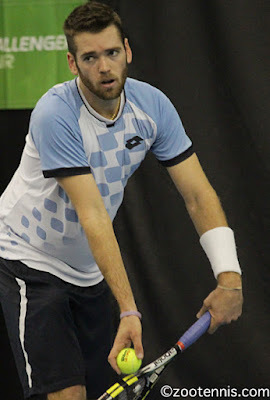 Tsygura received a spot in the main draw as a lucky loser, as did Christos Antonopoulos of Greece, who lost to Ambrozy. They are taking the place of Yucatan champion Mate Valkusz of Hungary, who withdrew today, and Denis Klok of Russia, who withdrew Saturday. Top seed Casper Ruud of Norway will start his quest for the title Monday against wild card Oliver Crawford, with No. 2 seed Stefanos Tsitsipas playing Mwendwa Mbithi. The draws and order of play for Monday, which includes 48 singles matches, can be found at eddieherr.com. The 12s, 14s and 16s will also begin main draw play on Monday, with the top half in each draw in action. The bottom half of each draw will play on Tuesday. Draws and Monday's times for the younger divisions are available at the Tennis Link site. 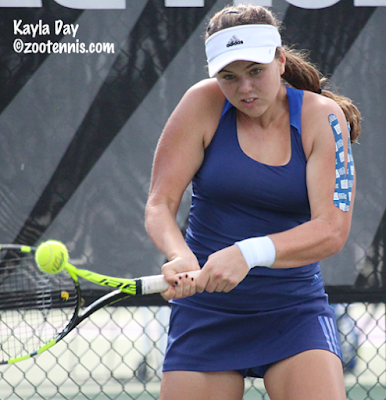 Kayla Day, who won the ITF Grade B1 last month in Tulsa, added another Grade 1 title to her resume last night at the Yucatan Cup. Day, the No. 5 seed, beat No. 4 seed Bianca Andreescu of Canada 7-5, 6-3 in the final. The 16-year-old from Southern California didn't lose a set all week. Andreescu got her revenge in the doubles final, when she and Vanessa Wong, the No. 6 seeds, beat No. 3 seeds Day and Alexandra Sanford 7-5, 6-3. Neither Day nor Andreescu will have much time to recover, as both are on the schedule Monday, which is a departure from scheduling in the past. Now the only players with Tuesday first round matches are qualifiers or their opponents. As mentioned previously, Valkusz, who would have been the No. 2 seed here at the Eddie Herr, withdrew, but Kenneth Raisma of Estonia, who lost 6-2, 6-4 to Valkusz in the Yucatan final, is also scheduled to play on Monday, taking on wild card Nathan Perrone. The boys doubles title went to No. 8 seeds Piotr Matuszewski and Kacper Zuk of Poland, who beat No. 2 seeds Valkusz and Louis Wessels of Germany 4-6, 6-2, 10-7. In the final of the WTA $125K in Carlsbad, California, No. 5 seed Nicole Gibbs fell to top seed Yanina Wickmayer of Belgium 6-3, 7-6(4). Down 5-0 in the first set, Gibbs fought back, but came up just against WTA No. 49. A beautiful Florida day was not pretty for the No. 2 seeds in the first round of qualifying of the Eddie Herr ITF Grade 1, with Eugenia Ganga of Argentina and Constantin Bittoun-Kouzmine of France falling to US juniors who didn't travel far for the competition. 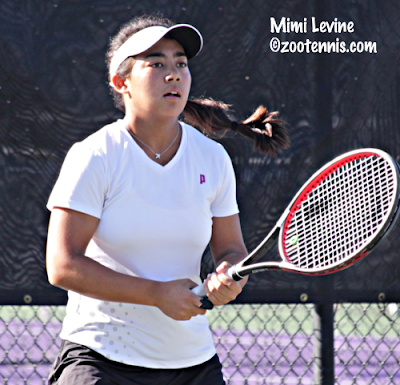 Mimi Levine, who trains at the IMG Academy, saved two match points in her 6-3, 1-6, 7-6(5) win over Ganga, and she appreciated the support of the half dozen friends cheering her on from the deck of the porch overlooking Court 1. Serving at 4-5 in the third set, Levine found herself at ad out twice, but each time Ganga made unforced errors early in the point. Levine went on to hold and break, so she was serving for the match, but she was broken at love, a circumstance Levine did not let bother her. "We kept breaking each other on that side," said Levine, who turned 17 last Sunday. "There was something with the wind. But she played a really good game, a solid four points. I just tried to go into the tiebreaker with a clean slate, not worry about that, because I knew that was the tougher side." Levine fell behind 5-3 in the tiebreaker, but Ganga threw in her second double fault of the tiebreaker to make it 5-4, and Levine won her two serves, with Ganga making forehand errors in both points to give Levine a match point. Levine converted when Ganga netted a backhand, with Levine's small cheering section expressing their delight, although doing so discreetly. "It was kind of like my home court, and all my friends were watching, so it was a really fun atmosphere," said Levine. "One of them is my roommate, but most of them are golfers. I'm friends with a lot of golfers. They're generally more reserved, because golf is super polite and stuff. But it was fun to have them watching." In addition to Ganga, No. 3 seed Hurricane Tyra Black and No. 5 seed Rafaella Baquerizo of Ecuador went out in first round play, with Kamilla Kokeladze of Russia beating Black 6-0, 2-6, 6-3 and Nadia Gizdova advancing over Baquerizo, 6-3, 3-1, retired. Four of the top eight seeds in boys qualifying lost, with wild card Ambrozy beating Bittoun Kouzmine 2-6, 7-6(3), 6-3 despite a gap of over 1200 places in the ITF junior rankings. "I played one ITF like six months ago and I did well, I got to the semis, but that's my only points, so that's why I needed a wild card to get into qualies," said Ambrozy, who lives in nearby St. Petersburg. Ambrozy, a senior who has committed to Columbia, obviously had no previous history with the 16-year-old from France, so he needed some time to assess his game. "I knew he was lefty coming in, so I knew that much. When he came on court I saw he was short, so I thought my kick might be good," said the tall 18-year-old. "It took me a couple of games to learn he is a really fast, grinding player that gets balls back. I was struggling with that in the first and a little bit in the second, but I managed to figure it out." Ambrozy said that growing up in Florida, he is comfortable on the Har-Tru courts used for the ITF tournament. He also is determined to make the most of his last nine months of junior competition before heading to Columbia next fall. "A lot of people stop playing tournaments, and they get to school, and it's like, wow, I'm not playing well right now because I haven't played a match in a year," Ambrozy said. "I have a pretty good birthday, it's in September, so I want to play Clay Courts and Kalamazoo my last year and do well there." No. 3 seed Alexis Galarneau of Canada, No. 7 seed Sebastian Arcila of Puerto Rico and No. 8 seed Jack Van Slyke of Canada all lost in opening round play. Christos Antonopoulos of Greece beat Galarneau 6-3, 6-3, Jacob Eskeland of Norway defeated Arcila 6-7(3), 6-1, 6-2 and John McNally downed Van Slyke 6-0, 6-3. Top qualifying seeds Hanna Chang and Rudolf Molleker of Germany advanced easily in their first round matches. Qualifying will be completed on Sunday, with two rounds, and those who qualify will not play on Monday. Usue Arconada and Denis Klok of Russia, both of whom would have been seeded in the main draw, have withdrawn. 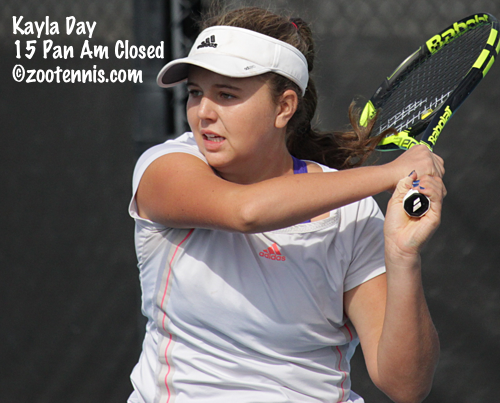 Complete results and Sunday's order of play can be found at eddieherr.com. The girls 16s qualifying is complete, with four US girls advancing to the main draw: Sarah Hua, Anna Letto, No. 4 seed Margaret Ownsby and No. 7 seed Vanessa Streng. The other four qualifiers are: Azul Agustina Pedemonti of Argentina, Fernanda Labrana of Chile, Adelaide Lavery of Canada and Sofiya Sokolova of Russia. The final round of qualifying for boys and girls 12s, boys and girls 14s and boys 16s is Sunday. At the WTA Carlsbad $125K, No. 5 seed Nicole Gibbs advanced to the final with a 6-0, 6-4 win over Jennifer Brady. Gibbs won the first nine games of the match, but Brady recovered from two breaks down in the second set to pull even, only to get broken a third time at 4-4, with Gibbs serving it out. The two-time NCAA champion will play top seed Yanina Wickmayer of Belgium, who beat Maria Sakkari of Greece 6-4, 6-2. Henri Laaksonen of Switzerland made it two straight titles in the US, beating Sekou Bangoura 6-3, 4-6, 6-1 in the final of the $15,000 Waco Futures. Laaksonen won the ATP $50,000 Challenger last week in Champaign. Next week, the ITF Men's Circuit will feature a new $15,000 Futures event in Tallahassee. Qualifying began there today. Qualifying for the 12s, 14s and 16s divisions at the Eddie Herr are in full swing, and the dozens of hard courts were all occupied when I arrived on a warm and sunny Friday afternoon at the IMG Academy. The Har-Tru courts were being used for practice, with the ITF Grade 1 tournament beginning on Monday, and qualifying, which consists of three rounds over two days, starting Saturday. Twenty US boys and 25 US girls are in the qualifying draws, with Hanna Chang the top seed and Hurricane Tyra Black the No. 3 seed. Qualifying matches begin at 7:45 Saturday morning. The draws and order of play can be found at eddieherr.com. At the Grade 1 Yucatan Cup, top seed Sonya Kenin was beaten by No. 6 seed Anastasia Potapova of Russia 6-0, 6-4 in Thursday's quarterfinals. In today's semifinal, Potapova lost to No. 4 seed Bianca Andreescu of Canada 6-3, 7-5, in a rematch of last year's Junior Orange Bowl 14s final, which Potapova won. Andreescu will play No. 5 seed Kayla Day in the final, after she won the all-American semifinal by downing No. 2 seed Usue Arconada 6-2, 6-3 tonight. Arconada had defeated No. 7 seed Evgeniya Levashova of Russia 6-0, 5-7, 6-3 in the quarterfinals and Day had beaten No. 13 seed Maria Mateas 6-2, 7-5. The last remaining US boy, No. 8 seed Ulises Blanch, lost in Thursday's quarterfinals to No. 13 seed Kenneth Raisma of Estonia 2-6, 7-6(2), 6-2. Raisma has reached Saturday's final, but his opponent won't be determined until later tonight. At the $125,000 WTA tournament in Carlsbad, California, Nicole Gibbs(5) and Jennifer Brady have reached the semifinals and will play each other. Gibbs defeated No. 2 seed Tatjana Maria of Germany 6-4, 2-6, 6-1 in today's quarterfinals and Brady got past unseeded Marina Melnikova of Russia 6-2, 7-5. CiCi Bellis, who had beaten Kat Stewart on Thursday to advance to the quarterfinals, lost to top seed Yanina Wickmayer of Belgium 6-4, 6-3. Wickmayer's opponent in the semifinals is Marie Sakkari of Greece, who beat Samantha Crawford 6-1, 6-7(3), 6-2. At the $15,000 Waco Futures, Sekou Bangoura will meet Henri Laaksonen of Switzerland in the final. No. 5 seed Bangoura edged Dennis Nevolo 3-6, 6-1, 7-6(1) and No. 2 seed Laaksonen topped No. 3 seed Nick Meister 6-3, 6-7(5), 6-4. Bangoura has already secured one title this week as he and Matt Seeburger won the doubles championship. The top seeds beat wild cards Julian Lenz and William Little, who play for Baylor, 1-6, 6-3, 10-6 in the final. This is an early post today, and I will be taking Thanksgiving off, but look for a post on Friday from the Eddie Herr, which I'll be covering for the 12th straight year. Keeping up with the Grade 1 Yucatan Cup in Mexico is not easy, with late night matches and limited live scoring and results posted, but today's third round features eight US girls in the final 16 and two US boys. The girls advancing are Sonya Kenin(1), Abigail Desiatnikov, Alexandra Sanford(11), Kayla Day(5), Taylor Johnson, Maria Mateas(13), Jessica Livianu and Usue Arconada(2). The boys are wild card Robert Loeb and No. 8 seed Ulises Blanch. Since Monday's post, a few more college commitments have been announced. A couple of big ones have not been on the schools' websites, but tweets indicate that Brandon Holt and Riley Smith are now officially committed to attending Southern Cal (no surprise there) and Emily Arbuthnott of Great Britain, currently No. 30 in the ITF junior rankings, has signed with Stanford. Florida State has announced the signing of Alex Knaff. North Carolina has announced the signings of Simon Friis Soendergaard and Joshua Peck. Cal has announced the signings of Bjorn Hoffman and Connor Heap. South Florida has announced the signings of Benjamin Hannestad and Mathieu Scaglia. Denver has announced the signings of Sean Huynh and Pedro Fernandez Del Valle. Gonzaga has announced the signings of Samuel Feit, Simon Homedes, and Vincent Rettke. SMU has announced the signing of Sarai Delfina Monarrez Yesaki. Saint Mary's has announced the signing of Jacqueline Pelletier. 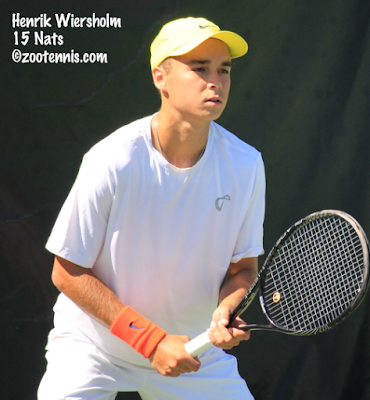 The University of Virginia put together an extensive account of sophomore Henrik Wiersholm's run to the title at the Pensacola Futures last week, with several quotes from Wiersholm on his learning experience as a freshman. Duke announced that Marc Spicijaric has been promoted to associate coach for the women's team, and that former University of Illinois women's head coach Michelle Dasso is the Blue Devils new volunteer assistant. I neglected to mention in Sunday's post that former UCLA star Jean-Julien Rojer won the ATP World Tour Finals with partner Horia Tecau. With their performance in London, the Wimbledon champions clinched the World No. 1 ranking for 2015, displacing Mike and Bob Bryan, who had finished No. 1 for the past six years. For more on Rojer and Tecau's year, see the UCLA website. Zootennis sponsor College Tennis Exposure Camps has its 27th annual camp scheduled for December 5 and 6 at the University of South Florida. For more information on registering for the event and a list of college coaches expected to attend, click here. If you are in the Indianapolis area, consider attending ATP pro Rajeev Ram's annual Entouraj for Kids charity event December 5 and 6 at the Carmel Racquet Club. Denis Kudla, Tommy Paul and Eric Butorac and of course, Ram, will be there, for exhibitions, clinics and auctions. Sixteen-year-old CiCi Bellis returned to competition for the first time since the US Open women's qualifying today at the $125,000 WTA Carlsbad, California tournament, beating No. 6 seed Julia Glushko of Israel 6-3, 6-4. Bellis, who has been injured, will play Katerina Stewart next. 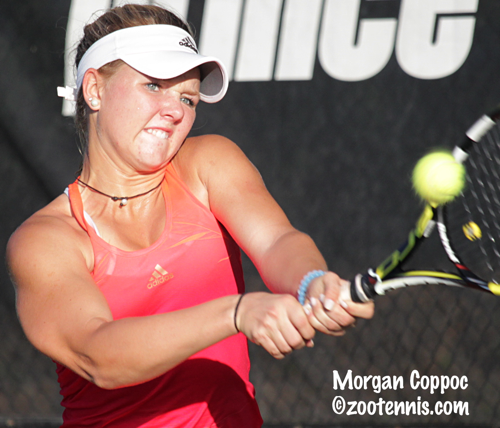 The 18-year-old Floridian advanced to the second round with a 7-5, 6-3 win over Paula Goncalves of Brazil Monday. Bellis and Stewart have played four times, twice in juniors and twice in Pro Circuit events last October, with Bellis going 4-0. Other Americans advancing to the round of 16 include Kristie Ahn, Samantha Crawford, Jennifer Brady and No. 5 seed Nicole Gibbs. Gibbs won in unusual fashion on Monday, when her opponent, Alla Kudryavtseva of Russia, was defaulted with Gibbs leading 6-3, 3-2 after apparently for unsportsmanlike conduct. She apologized on twitter, specifically to Gibbs and to her doubles partner, Vania King, calling her behavior "unacceptable." Defaults for misconduct put the player out of the tournament, so King was unable to compete in doubles with an alternate team taking their place. At the $15,000 Waco Futures, 12 of the 16 players remaining in the draw are current or former college players. Dennis Nevolo (Illinois), who defeated top seed Daniel Nguyen(USC) yesterday, will play Texas A&M sophomore Arthur Rinderknech, a qualifier; TCU sophomore Cameron Norrie will face No. 6 seed Stefan Kozlov; No. 4 seed Tom Jomby(Kentucky) will play qualifier Jacob Sude(Oklahoma State); Clay Thompson(UCLA) meets No. 5 seed Sekou Bangoura(Florida); qualifier Robbie Mudge(North Carolina State) plays No. 8 seed Maximiliano Estevez of Argentina; Baylor senior Julian Lenz faces No. 3 seed Nick Meister(UCLA); TCU sophomore Guillermo Nunez plays No. 7 seed Tigre Hank of Mexico and Baylor junior Maxime Tchoutakian faces Champaign Challenger champion, No. 2 seed Henri Laaksonen of Switzerland. The USTA posts an Honor Roll every month of the top performances by US players aged 20 and under, recognizing both the player and their coaches. Although I try to mention as many of these achievements as I can for those 18-and-under, I do miss a few, so please check out this detailed list. The ITA released the NAIA fall rankings today, with Kevin Konfederak and Jordan Cox of Georgia Gwinnett No. 1 and No. 2. Georgia Gwinnett also has the top-ranked women in NAIA, Valeria Podda. In the Division II rankings, released yesterday, Alejandra Cisneros of Armstrong State is the top-ranked woman, and Jan Meyer of Azusa Pacific is No. 1 in the men's rankings. The Division III fall rankings came out earlier this month, with Eudice Chong of Wesleyan and Noah Farrell of Middlebury No. 1 in singles. The links to the complete lists for all divisions can be found at the ITA rankings page. While I was at the Champaign Challenger last week, I had an opportunity to catch up with Austin Krajicek, who reached the quarterfinals in singles and the final in doubles there. Krajicek, who won the Kalamazoo 18s title in 2008 and the NCAA doubles title with Jeff Dadamo in 2011, his last year at Texas A&M, explained how he has made the transition to the pro game in the past four years. Now just outside the Top 100, Krajicek has been as high 94, having reached the quarterfinals of an ATP 500 event in Tokyo last month. My interview with Krajicek is available now at the Tennis Recruiting Network. Now that the early signing period for 2016 is over, many schools have posted their releases on their incoming recruits. I've been collecting links of those I've seen on Twitter, and I'm providing them below. I apologize if I've missed some. The University of Georgia has announced the signings of Nathan Ponwith, Robert Loeb, Alex Phillips and Alex Diaz. The University of Tennessee has announced the signing of Steven Karl. LSU has announced the signings of Agustin Moreno and Nikola Samardzic. Texas A&M has announced the signing of Hady Habib. Vanderbilt has announced the signing of Billy Rowe. The University of Washington has announced the signing of Amit Batta. The University of Oregon has announced the signing of Ty Gentry. The University of Arizona has announced the signing of Andres Reyes. The University of Utah has announced the signings of Jon Dollahite and RJ Parker. Indiana University has announced the signings of Bennett Crane and Zac Brodney. The University of Illinois has announced the signings of Zeke Clark and Gui Gomes. The University of Michigan has announced the signings of Nick Beaty and Connor Johnston. The University of Wisconsin has announced the signings of Chase Colton and Osgar O'Hoisin. The University of Nebraska has announced the signings of Dylan Bednarczyk and Chris Dean. Georgia Tech has announced the signing of Christopher Yun. Florida State has announced the signing of Guy Orly Iradukunda. Duke University has announced the signings of Robert Levine and Nick Stachowiak. North Carolina State has announced the signing of Sean Burnette. The University of Louisville has announced the signing of Parker Wynn. The University of Texas has announced the signing of Yuya Ito. Texas Tech has announced the signing of Augusto Stodart. Brigham Young has announced the signings of Brocton Andrus and Garret Vincent. The University of Michigan has announced the signing of Chiara Lommer. The University of Nebraska has announced the signings of Jeannie Lozowski, M’Balia Bangoura, Hayley Haakenstad and Emma Worley. Michigan State has announced the signing of Samantha Memije. The University of Wisconsin has announced the signing of Michelle Linden, Melissa Pick and Christina Zordani. The University of Minnesota has announced the signings of Tina Kreinis and Karyna Bihel. The University of New Mexico has announced the signing of Alexandra Chung. Boise State has announced the signings of Lilian Poling, Jovana Kuljanin and Wilhelmina Palmer. Utah State has announced the signings of Sophia Haleas, Ellee Bullock and Hannah Jones. Tulane has announced the signing of Christina Sisti. Middle Tennessee State has announced the signings of Lidia Burrows and Holly Horsfall. Old Dominion has announced the signing of Holly Hutchinson. North Texas has announced the signing of Kalani Soli. Brigham Young has announced the signings of Natella Nabieva Samantha Smith and Kate Cusick. The University of Tennessee has announced the signings of Mary Caroline Meredith and Ariadna Riley. Auburn University has announced the signings of Taylor Russo and Roos Van Der Zwaan. The University of Missouri has announced the signings of Mackenzy Middlebrooks and Tate Schroeder. The University of Mississippi has announced the signing of Anna Vrbenska. Texas A&M has announced the signing of Constance Branstine. The University of Florida has announced the signing of Ingrid Neel. The University of Georgia has announced the signing of Marta Gonzalez Encinas. LSU has announced the signings of Rebecca Weissman, Jade Lewis and Raveena Kingsley. The University of Alabama has announced the signings of Makenna Jones and Madison Pothoff. Vanderbilt has announced the signing of Christina Rosca. The University of Oregon has announced the signing of Julia Eschet. The University of California has announced the signing of Alexis Nelson. The University of Washington has announced the signings of Katarina Kopcalic and Lana Slavica. The University of Arizona has announced the signing of Paris Corley. Arizona State has announced the signing of Savannah Slaysman. UCLA has announced the signing of Ena Shibahara. Southern Cal has announced the signing of Angela Kulikov. The University of Utah has announced the signing of Emily Maxfield. Florida State has announced the signings of Nandini Das and Mary Haffey. Notre Dame has announced the signings of Zoe Spence and Bess Waldram. Clemson has announced the signing of Sydney Riley. Georgia Tech has announced the signings of Kenya Jones, Nadia Gizdova and Nami Otsuka. The University of North Carolina has announced the signings of Alexandra Sanford and Sarah Daavettila. North Carolina State has announced the signings of Anna Rogers and Adriana Reami. The University of Virginia has announced the signings of Hunter Bleser, Camille Favero and Chloe Gullickson. The University of Oklahoma has announced the signings of Ann Selim and Julie Byrne. Fourteen-year-old Amanda Anisimova's only previous appearance in a Grade A tournament was in September's US Open, where she qualified, but lost in the first round. This week on the red clay of the Abierto Juvenil Mexicano in Mexico City, the unseeded Anisimova has swept through the draw, advancing to Sunday's final with a 7-6(3), 6-4 victory over No. 7 seed Evgeniya Levashova of Russia. Anisimova will face Australian Open girls finalist Katie Swan of Great Britain, who defeated Alexandra Sanford 7-6(6), 7-6(3). Swan, the No. 3 seed, served for the first set at 6-5, but was broken; Sanford, the No. 11 seed, served for the second set at 6-5, but she too was unable to close it out. Swan was just slightly better on the big points in both tiebreakers, with Sanford making errors on the final points of both sets. The boys final will feature unseeded Genaro Alberto Olivieri of Argentina against No. 13 seed Youssef Hossam of Eygpt. The 17-year-old Olivieri is playing in only his second Grade A main draw, while Hossam, also 17, hadn't won a Grade A match in three attempts prior to this week. The doubles titles were decided today, with No. 3 seeds Jay Clarke of Great Britain and Miomir Kecmanovic of Serbia defeating No. 5 seeds Geoffrey Blancaneaux and Ugo Humbert of France 6-4, 6-4 in the boys final. Levashova and Anna Blinkova of Russia, the No. 2 seeds, took the girls doubles title, beating top seeds Swan and Sonya Kenin 7-5, 6-4. Sunday's finals will be streamed, beginning with the girls final at noon Eastern, at tennisjuniortv.com. Switzerland's Henri Laaksonen won the $50,000 Champaign Challenger, defeating Taylor Fritz 4-6, 6-2, 6-2 this afternoon. The 23-year-old's first Challenger title gives the USTA's Australian Open wild card to Noah Rubin, who won the first of the three Challengers in the race in Charlottesville earlier this month. Rubin, who would not have made the qualifying draw in Australia, will be playing in his second slam main draw. 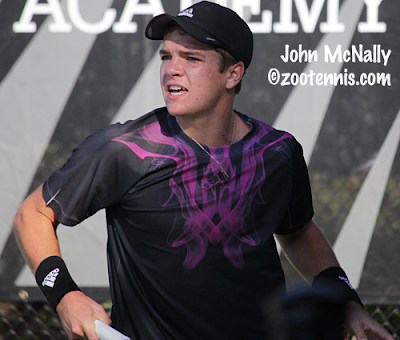 He played at last year's US Open as the Kalamazoo 18s champion. Fritz, along with Donaldson and Tiafoe and possibly Tommy Paul, are US teens who will receive entry into the Australian Open qualifying based on their rankings. Fritz, who had saved 28 consecutive break points over four matches, saw his luck run out in the second and third sets, as he could not find his serve (31% first serves in the second set, 41% for the match) and Laaksonen consistently attacked his second serve. Laakson was down a set in his previous three matches, so he had no reason to panic after dropping the first set, and he played at a consistently high level throughout the match. Based on his performance in Champaign this week, Fritz will move into the ATP Top 200 for the first time. Former Memphis teammates David O'Hare of Ireland and Joe Salisbury of Great Britain won the doubles title, defeating top seeds Austin Krajicek and Nick Monroe 6-1, 6-4 in the final. O'Hare and Salisbury, who completed their collegiate eligibility in 2014, were unseeded, but had also reached the semifinals of the Charlottesville Challenger. The pair have seven Futures titles together, with this their first Challenger title. An eighteen-year-old will win his first Futures title tomorrow, with unseeded Alex Rybakov taking on qualifier Henrik Wiersholm at the $10,000 Pensacola Futures. Wiersholm had the easier time advancing, beating 16-year-old qualifier Denis Shapovalov of Canada 6-2, 6-2, which ended Wiersholm's streak of 6-0 sets at four. 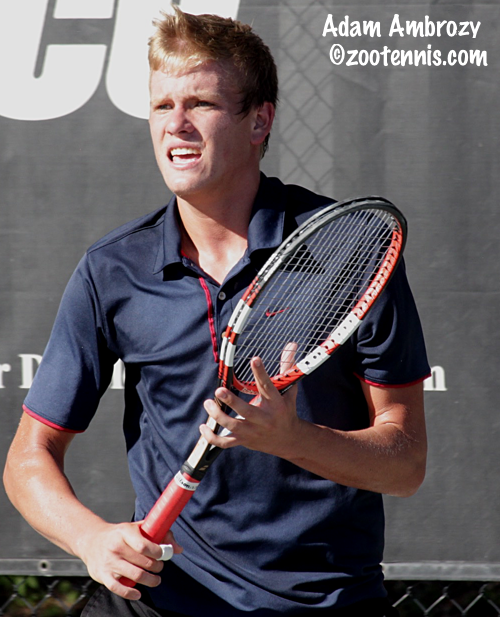 Rybakov, who will start at TCU in January, needed over two hours to get past No. 6 seed Maximiliano Estevez of Argentina 6-1, 3-6, 7-5. 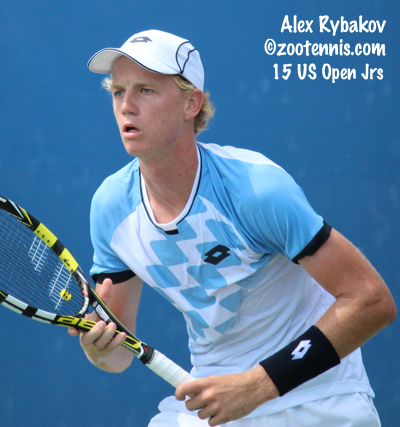 Rybakov was a finalist last week in Niceville, his first Futures final. Wiersholm, a sophomore at Virginia, had not earned an ATP point until this week, but could collect 17 if he wins Sunday. Shapovalov split his matches on Saturday, taking the doubles title with former Texas A&M-Corpus Christi standout Peter Nagy of Hungary. Nagy and Shapovalov, who won the US Open boys doubles title this year with Felix Auger-Aliassime, defeated wild cards Christopher Ephron, a Northwestern recruit from Pensacola, and former West Florida player Bruno Savi of Brazil 6-3, 6-2 in the final. Last month Bobby Knight of College Tennis Today wrote a guest post here providing his suggestions for growing college tennis. Only a couple of Bobby's excellent proposals mentioned lineups or format, but I've developed a pet concept of my own about lineup selection that I detailed today for the Tennis Recruiting Network. With drafts now a regular part of the sports landscape, why not set lineups for each dual match in a similar fashion, rather than a exceedingly hard to define and police "order of strength"? I would love to hear from you, pro or con, on what I've proposed. What are the drawbacks? How could it be improved? Does it promote parity, favor stronger teams, or is it neutral? 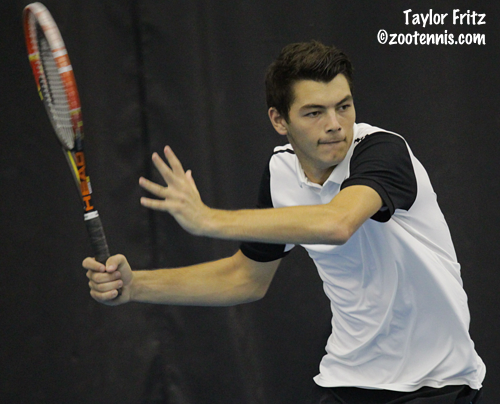 Taylor Fritz has reached his third Challenger final since October, defeating qualifier Mackenzie McDonald 6-7(4), 6-2, 6-2 in a two-hour battle at the Atkins Tennis Center in Champaign. Fritz, who saved 15 of 15 break points tonight, will play unseeded Henri Laaksonen of Switzerland in Saturday's final, after Laaksonen outlasted qualifier Clay Thompson 5-7 ,6-3, 7-6(2). After a week of multiple scenarios for the distribution of the USTA's Australian Open wild card, it is now simple: if Fritz wins the title, he will when the wild card. If Laaksonen, who will be playing in his first Challenger final, wins it, the wild card will go to Charlottesville champion Noah Rubin. The doubles final will be between top seeds Austin Krajicek and Nick Monroe and unseeded David O'Hare of Ireland and Joe Salisbury of Great Britain, former University of Memphis players. That begins at 1 p.m. eastern Saturday, with the singles final to follow. Live streaming is available at the ATP Challenger website. For additional coverage of the Champaign Challenger, visit Jonathan Kelley's On The Rise Tennis blog. He spoke with Clay Thompson after his quarterfinal win last in this post. Two US girls have reached the semifinals of the ITF Grade A Abierto Juvenil Mexicano: unseeded Amanda Anisimova and No. 11 seed Alexandra Sanford. Anisimova defeated fellow 14-year-old Abigail Desiatnikov 6-3, 6-2 and has yet to lose a set in just her second Grade A tournament. She will play No. 7 seed Evgeniya Levashova of Russia, who took out top seed Sonya Kenin 6-1, 4-6, 6-4. The 16-year-old Sanford, who is into her first Grade A semifinal, beat unseeded Hanna Chang 6-1, 7-6(2) and will play No. 3 seed Katie Swan of Great Britain. Swan survived against Sofia Sewing 7-5, 3-6, 7-5. Swan and Kenin, the top seeds in doubles, reached the final, where they will play No. 2 seeds Levashova and Anna Blinkova, also of Russia. No. 8 seed Ulises Blanch, the last US boy still alive, lost to unseeded Genaro Alberto Olivieri of Argentina 2-6 6-3, 6-4. The boys top seed, Mate Valkusz of Hungary, also lost today, falling to No. 12 seed Benjamin Sigouin of Canada 3-6, 6-1, 6-2. Live scores, live streaming, draws and schedules can be found at the tournament website. Three teenagers have reached the semifinals at the $10,000 Futures in Pensacola: 18-year-olds Henrik Wiersholm and Alex Rybakov and 16-year-old Denis Shapovalov of Canada. Wiersholm, the University of Virginia sophomore, won his second straight 6-0, 6-0 match, beating No. 3 seed Evan King today after blanking Andrew Carter on Thursday. Wiersholm will put that streak of 6-0 sets to the test in Saturday's semifinal against fellow qualifier Denis Shapovalov, who beat Denis Nguyen(Harvard), also a qualifier, 6-0, 6-3 in today's quarterfinal. Rybakov will be looking for his second straight Futures final when he takes on 26-year-old Maximiliano Estevez of Argentina, the No. 6 seed, Saturdya. Estevez defeated Nick Chappell 6-7(5), 6-3, 6-4, while Rybakov took out No. 4 seed Wil Spencer 6-2, 6-4. The Champaign Challenger semifinals Friday will feature three Americans, qualifiers Clay Thompson and Mackenzie McDonald and Taylor Fritz. Fritz, who defeated top seed Malek Jaziri of Tunisia 6-2, 6-1 this evening for his third win over a Top 100 player, will face McDonald in the semifinals, after the UCLA junior downed Mitchell Krueger 7-5, 6-1 to advance to his second career Challenger semifinal. The winner of that match will have a chance to earn the Australian Open wild card with a victory in the final, but a loss will give the wild card to Noah Rubin, the Charlottesville Challenger champion, who currently leads in the race. McDonald and Fritz met back in January in the second round of the Los Angeles Futures, with Fritz winning 6-3, 6-4. Thompson, who beat No. 2 seed Austin Krajicek 4-6, 7-5, 6-3 to continue his outstanding run (which includes his first Challenger win, his first Challenger quarterfinal and now his first Challenger semifinal) will play the only international player left in the draw, unseeded Henri Laaksonen of Switzerland, who defeated Eric Quigley 3-6, 6-0, 6-1 today. Thompson cannot win the Australian Open wild card because his he can only tie Rubin with a title, and the tiebreaker is ATP ranking, with McDonald and Fritz winning that tie, but Thompson coming up short. 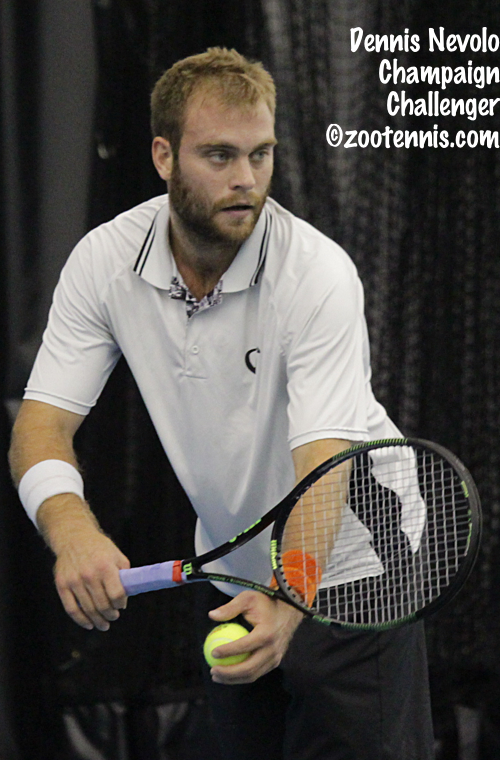 For more on the Champaign Challenger, check out Jonathan Kelley's On The Rise Tennis blog. US girls continue to dominate at the Grade A Abierto Juvenil Mexicano, with six of them through to the quarterfinals. Top seed Sonya Kenin and No. 11 seed Alexandra Sanford are joined in the final eight by unseeded Sofia Sewing, Amanda Anisimova, Abigail Desiatnikov and Hanna Chang. Anisimova and Desiatnikov, both 14, play each other, as do Sanford and Chang. Chang defeated No. 2 seed and Wimbledon girls finalist Anna Blinkova of Russia 7-6(7), 3-6, 7-5 in today's third round. Three of the four teams in the girls doubles semifinals also feature Americans. No. 8 seed Ulises Blanch is the only US boy still in either draw. He will face unseeded Genaro Alberto Olivieri of Argentina in the singles quarterfinals. Links to live scoring, live streaming, draws and Friday's order of play can be found at the tournament website. A player in the top 100 today is on average 2.3 years older than he was in 2005; a player in the top 50 is now 3.1 years older; and a player in the top 25 is 4.1 years older. Today’s top 10 pros have spent, on average, 11 years in the top 100, 7 years in the top 10 and 4.5 years in the top 5. This trend can't continue indefinitely, but it's anybody's guess when the pendulum will begin to swing the other way. For many years, the stars of pro golf were in their 30s and 40s, but now the best players in the world are in their 20s. Tennis certainly requires more athleticism and is more physically demanding, but so far that hasn't kept those in their 30s from staying at the top of the game. A big Division I signing was announced today, with LSU getting a National Letter of Intent from Raveena Kingsley, the No. 2 recruit in the Tennis Recruiting Network's class of 2016. Kingsley has a WTA ranking of 613 and has been ranked as high as 22 in the ITF junior rankings. She joins Jade Lewis and Rebecca Weissmann to give LSU three blue chip recruits for the class of 2016. I'm back home after a day and a half at the $50,000 Champaign Challenger, which has produced multiple story lines as the final tournament in the Challenger portion of the USTA Pro Circuit. The USTA's Australian Open wild card will be decided this week, and unlike last year, when only two Americans reached the quarterfinals, this year six US players are in the quarterfinals, with five still in the running for the wild card. One of those is 18-year-old Taylor Fritz, who defeated last week's champion in Knoxville, Dan Evans of Great Britain 6-2, 3-6, 6-4 in the first match of the day. Fritz, who did not play Charlottesville, the first tournament in the USTA's Australian Open Wild Card Challenge, and lost in the first round of Knoxville, needs to win the tournament to tie current race leader Noah Rubin, the Charlottesville champion. The tiebreaker is ATP ranking, and Fritz has moved into the Top 200, while Rubin is at 339. In his run to two Challenger titles in October, Fritz beat a raft of players ranked ahead of him, he said that Evans presents one of the worst match ups for him. "A guy like that is someone I don't think I could have ever beaten a couple of months ago," said Fritz. "That's just the worst possible match up for me--someone who slices every ball, keeps it low, doesn't make too many mistakes, is fast. He doesn't give me much to work with; it's tough to generate power against him, he keeps everything low." The first set certainly didn't indicate Fritz was having any trouble, with his serve producing five aces despite a low percentage of first serves. He broke Evans to take a 4-2 lead, then broke again for the set, with a great return sealing it. The second set produced a different vibe. Fritz led 40-0 in the opening game, but was eventually broken. Lacking in energy and tired from some of the long points, Fritz said he was having difficulty breathing, a sensation new to him. He got the first break back, but Evans got another at 3-all, and a third to close out the set. In the third game of the third set, Evans could not buy a first serve and after three deuces, Fritz broke. Evans, who often vented his frustration with line calls missed and lets not called, sometimes profanely, kept fighting and had three break point chances to get back on serve with Fritz serving at 3-2. Fritz got his first serve in each time and held on. Fritz was relying on his one break to see him through the final set, and was only to happy to have Evans serving first. "It was good that he served first, because after the changeover, I got to serve rested and not tired at all," Fritz said. "If I got an easy enough hold, I could focus on breaking and that's what I did. I got that one break and I told myself not to kill myself trying to break him again, just conserve energy and focus on the service games to get it done." Serving for the match, Fritz started with a double fault, but a forehand winner, an error by Evans and a two-overhead point made it 40-15. Evans forehand landed on the line to save the first match point, but Fritz hit an ace to move into his fourth Challenger quarterfinal, all since October. Fritz is planning to train in Carson next month, with the USTA. "Right after this tournament, I'm going to take a vacation," said Fritz. "Then I'm going to come back and train for a full month at Carson. They've got a really good program there for the off season I think, doing a lot of different things to make it good. I'm going to get a place in LA somewhere for the month and just train." As for his schedule for the first few months of 2016, Fritz, who is assured of making the Australian Open men's qualifying, is still not sure whether he will try to qualify for some of the smaller ATP events prior to Australia, or play Challengers. "Challengers might be a good play to get some more matches in, but there would be a lot of good practice at the ATPs," said Fritz, who will make those decisions with his agents at CAA and USTA coach David Nainkin during the off season. Fritz is no longer being coached by his father Guy, who developed his game. "If I need some advice on the serve, I'll go talk to him," said Fritz. "He knows what he's talking about. I feel at this point, I've been with him so long and he's done everything for me. Obviously I wouldn't be anywhere close to where I am without him. But I don't think there's anything he could tell me that I don't already know from him. I've just been with him for so long. I think I just need someone who is going to make me work hard and who I'm going to be motivated to work hard for." Fritz will play top seed Malek Jaziri of Tunisia in the quarterfinals. Jaziri defeated Daniel Nguyen 7-5, 7-6(5), eliminating Nguyen from Australian Open wild card contention. 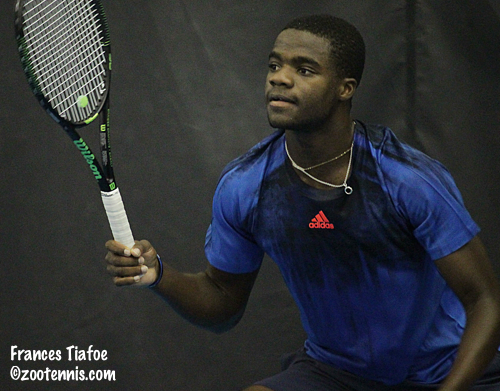 Also eliminated was Frances Tiafoe, who lost to Eric Quigley 6-3, 6-7(3), 6-4. Quigley, the 2012 NCAA singles finalist while at Kentucky, played outstanding tennis throughout most of the match, and Tiafoe was increasingly frustrated by Quigley's high level and what he considered the low level of the umpiring. His first racquet throw came early in the first set, and after Quigley got the only break of the third set with Tiafoe serving at 4-5, Tiafoe destroyed his racquet. Five minutes later, officials were still working to corral the shattered pieces, using a dustbuster for the final clean up. Quigley, who can win the Australian Open wild card if he wins the title, plays unseeded Henri Laaksonen of Switzerland in the quarterfinals. There are two all-American quarterfinal matches. Qualifier Mackenzie McDonald, a UCLA junior, will play Mitchell Krueger with the winner of that match retaining his shot at the wild card. McDonald advanced when No. 3 seed Ryan Harrison retired with a shoulder injury at 2-6, 6-1. Krueger defeated No. 6 seed JP Smith of Australia 7-5, 7-6(3). No. 2 seed Austin Krajicek is likely to make the Australian Open on his own ranking, which was 101 coming into this tournament. If he wins the tournament, he will not need the wild card, but as of right now, he is still considered eligible for it. Krajicek, who I spoke to at length yesterday for an upcoming Tennis Recruiting article, advanced to the quarterfinals with a 7-6(3), 6-3 win over Adrien Bossel of Switzerland. 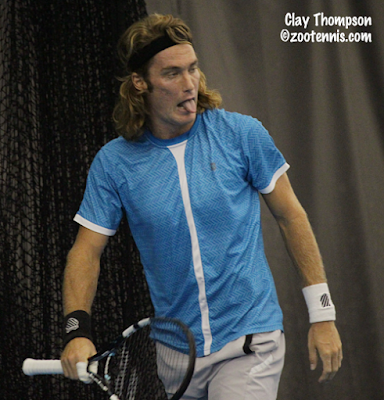 Krajicek's opponent will be qualifier Clay Thompson, who defeated No. 8 seed Blaz Rola of Slovenia 7-6(4), 6-3 in the last match of the evening. Former UCLA Bruin Thompson, who hadn't won a Challenger match until last night's 7-6 in the third win over Dennis Nevolo, is improving his ranking substantially with his impressive play this week, but his current ATP ranking of 603 would not rise enough with the title to put him ahead of Rubin. Thompson, a free spirit with unpredictable vocal expressions and reactions, is adding a bit of levity, not to mention great tennis, to the final few days of Challenger tennis in the United States for 2015. Complete results and the order of play for Thursday can be found at the ATP website. Frances Tiafoe was down a set and a break to No. 5 seed Alejandro Falla of Colombia Tuesday afternoon in the first round of the Champaign Challenger at the University of Illinois' Atkins Tennis Center, but fought his way to a 4-6, 6-3, 6-2 victory to keep his Australian Open wild card hopes alive. Falla had just come back from 0-40 down serving at 0-1 in the second set, then broke the 17-year-old to take a 2-1 lead. In the last tournament of the year, coming off a final two days ago in the Knoxville Challenger, Tiafoe had a decision to make. "Mentally, I really wasn't ready to play going on court," said Tiafoe, who was down 3-0 with two breaks in the first set before recovering. "There was a lot of negativity...the last tournament of the year, I had a good week last week, it's tough. The body's feeling it, you're playing a good player, it's not bad if you lose this match. But there's a lot a stake this week for me. Down a set and a break I was being an idiot, saying dumb stuff, and I was like ok, am I going to throw this away or am I going to compete?" Falla went up 30-0 in his next service game, but Tiafoe began to match the 32-year-old's level, and winning two long rallies gave him renewed energy. At 30-40, Falla double faulted, and Tiafoe, whose defense kept him in the points until then, began to take control. "One thing led to another," said Tiafoe. "I started digging, he started missing. I started playing really well and I'm happy to move on to the second round." Tiafoe had to save two break points serving for the second set at 5-3, with Falla missing two returns, including one on a second serve to bring it back to deuce. Two aces and a forehand winner, with a forehand shank in between gave Tiafoe the set, and he took a 5-0 lead in the third set, as Falla's errors began to pile up. Tiafoe couldn't serve out the set the first time, and saw two match points come and go in Falla's service game, but he finished it on his second attempt, with Falla's errors again providing assistance. Tiafoe can win the USTA's Australian Open wild card this week, as he is now in second place in the race, with the leader, Noah Rubin, out of the tournament and unable to gain any more points. But Tiafoe, who is assured of making the Australian Open qualifying, isn't focusing on that particular prize. "I'm not really thinking about that too much," said Tiafoe, currently at an ATP career high of 182. If I win this, maybe I'm 150, and that's more what I'm thinking. I just want to end the year strong here, don't have the mentality that it's the last tournament of the year, just throw it away. Just go out there, compete, and have fun. If a guy outbattles me, then too good." Tiafoe will play Eric Quigley in the second round on Wednesday. UCLA junior Mackenzie McDonald also needed to come back from a set down to advance to the second round, defeating Illinois senior Jared Hiltzik 3-6, 6-1, 6-0. Hiltzik, a wild card, got the sole break of the first set, while holding his own serve easily throughout. McDonald, who won three qualifying matches, two of them from a set down, was not about to panic after the first set. "The first set he served really well," said McDonald, who reached the semifinals and quarterfinals of two Challengers in Northern California this fall. "He aced me a lot and was very tricky there. I might have been going for a little too much, but in the second set I kind of calmed down. I served better, and I don't think he served as well, so I took advantage of that and was attacking." McDonald, who is currently in school at UCLA, is still undecided about the timing of his turning pro. "It's nice I'm having these results," said the 20-year-old. "It means I can play at this level and it's where I want to be. But as far as turning pro, I'm not too sure it's going to happen yet. We'll see." McDonald will play No. 3 seed Ryan Harrison Wednesday night. Champaign has not one but two qualifiers with UCLA ties, with Clay Thompson collecting his first Challenger win by defeating former Illinois All-American Dennis Nevolo, a wild card, 4-6, 6-4, 7-6(2). The 23-year-old Californian, who doesn't shy away from displaying his emotions or approaching the net, was down 0-40 at 4-4 in the second set, only to hold and break to extend the match. Nevolo earned the first break of the third set at 5-5, but he was unable to serve out the match, with Thompson hitting one of his many forehand winners at 30-40. The tiebreaker was all Thompson, with his serve and his forehand earning him two mini-breaks, which was all he needed. Thompson will face No. 8 seed Blaz Rola of Slovenia, who won his NCAA title at Illinois in 2013, in Wednesday's second round. Other US winners on Tuesday included No. 2 seed Austin Krajicek, who defeated qualifier Raymond Sarmiento 6-4, 6-4, and Mitchell Krueger, who beat Jared Donaldson by the same score. I will be at the tournament again on Wednesday for the early matches, which include Taylor Fritz against Knoxville champion Daniel Evans of Great Britain, Krajicek versus Adrien Bossel of Switzerland and the Tiafoe-Quigley contest. Complete draws and the order of play are available at the ATP Challenger site, which also provides the links to live streaming. 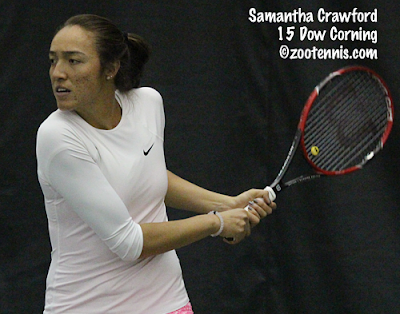 Samantha Crawford won the USTA's Australian Open Wild Card Challenge, defeating Viktorija Golubic of Switzerland 6-3, 4-6, 6-2 to claim her first professional singles title at the $50,000 Scottsdale tournament. Much as she had done last summer, when she reached the championship match of the third and final USTA Pro Circuit event to secure the US Open wild card, Crawford secured the Australian Open wild card by doing what she had to do at the last possible moment. Leading 6-3, 2-3 ad out when play was stopped last night due to rain in the Scottsdale area, Crawford certainly had additional time to consider what the win would mean for her. When she and Golubic returned to the court this morning, Crawford saved the break point, but ended up dropping the game. She got the break back leveling the set at 4, but serving at 4-5, she lost her serve again and Golubic was right back in the match. Crawford, who has twice played in the main draw of the US Open, recovered quickly, getting a 3-0, two-break lead, but she was broken for 3-1, Golubic held and Crawford went down 0-30. She held however, using her power to keep Golubic defending, not attacking, and then broke again to go up 5-2. The 20-year-old closed out the championship on her serve without any further complications and will play her first slam outside of the US in January. 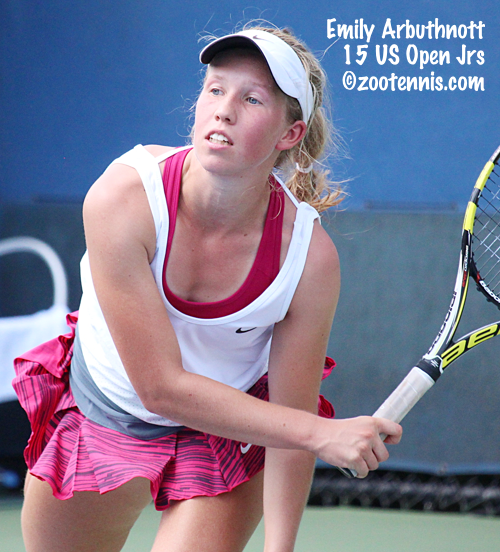 Jonathan Kelley has posted a detailed review of Crawford's career since she rose to prominence in the juniors as the 2010 Eddie Herr 16s champion on his On The Rise blog. Kelley calls Crawford the Ultimate Wild Card, and explains why the 2012 US Open girls champion deserves that label. The ITF Grade A Abierto Juvenil Mexicano in Mexico City is underway with 26 of the 64 competitors in the girls draw from the US, including top seed Sonya Kenin. In addition to Kenin, Usue Arconada(5), Kayla Day(6) Alexandra Sanford(11) and Maria Mateas(13) are seeded, and all won their first round matches today. Five of the eight girls qualifying are American: Nadia Gizdova, Whitney Osuigwe, Ellie Douglas, Rachel Lim and Ashley Lahey. The boys field is much less US-dominated. Of the ten American boys in the main draw, only Ulises Blanch(8) is seeded. Four of the ten are qualifiers: Jason Legall, Andrew Fenty, Caleb Chakravarthi and Robert Loeb. Mate Valkusz of Hungary, currently 11 in the ITF rankings, is the top boys seed, while there are five Top 10 girls competing. There is live streaming and live scoring (although the latter had quite a few problems today). Links to those features and draws can be found at the tournament website. Several of the US boys who could be playing in Mexico City are instead at the $10,000 Pensacola Futures. Vasil Kirkov, Gianni Ross and Nathan Ponwith all won their fourth and final qualifying matches today to advance to the main draw, as did Virginia sophomore Henrik Wiersholm and Washington sophomore Mitch Stewart. Sixteen-year-old Denis Shapovalov of Canada also reached the main draw via qualifying for the second straight week. Patrick Kypson, who picked up his first ATP point last week in Niceville, received a wild card. Speaking of first ATP points, Christopher Clarey of the New York Times went to the Birmingham Futures two weeks ago and wrote this piece on that topic. Ryler DeHeart, Patrick Daciek, Jean Yves-Aubone, Korey Lovett and Ryan Lipman are among those quoted in the article. He also spoke to the top players about their memories of their first ATP points for this article. Today marks the first anniversary of the death of Sean Karl, a member of the University of Tennessee men's tennis team who was stricken with Ewing's Sarcoma. This summer Steed Johnson wrote a moving piece on what he learned from Karl and his teammates during the battle with the illness that took Karl's life. Today is an appropriate time to revisit his tribute and remember a young tennis player gone much too soon. Two lefthanders, Ohio State freshman Francesca Di Lorenzo and Tulane senior Dominik Koepfer, made history for their schools Sunday in the finals of the USTA/ITA Indoor Intercollegiate Championships at the USTA Billie Jean King Tennis Center in New York. Eighteen-year-old wild card Di Lorenzo, who defeated unseeded Joana Eidukonyte of Clemson 6-1, 6-3 gave the Buckeye women's program its first national title, while Koepfer, a 6-1, 7-5 winner over Cal's Andre Goransson won Tulane's first national title in the modern collegiate era, and the first since 1955. Di Lorenzo, who lost only one set in her five victories--to defending champion Julia Elbaba in the quarterfinals--started quickly, going up two breaks for a 3-0 lead. The New Albany, Ohio resident lost her next two service games, but was able to break the senior from Lithuania two more times, including in the final game of set, when Di Lorenzo won a deciding point in the no-ad format. An easy hold to start the second set, a break and another easy hold gave Di Lorenzo a 3-0 lead, and Eidukonyte began to press, making unforced errors in an attempt to put some pressure on Di Lorenzo. Eidkukonyte was also determined to try to take advantage of Di Lorenzo's serve by standing way inside the baseline for the return, but that tactic proved largely ineffective, and it certainly didn't pressure Di Lorenzo into double faults. Di Lorenzo got out to a 5-0 lead before Eidukonyte held, and although she did need to win a deciding point to close it out, a first national title was secured with little sign of nerves or drama. "I think (the match) went pretty well," Di Lorenzo told Dan Johnson of the ITA. "I wasn't hitting my backhand as well as I would've liked or how I had in previous matches, but I think I kept the ball moving well with my forehand, moved her well and came in when I had my opportunities." For more on Di Lorenzo's win, see the Ohio State website. Koepfer was in an entirely different situation, having reached the semifinals of the National Indoor last year and the final last month at the All-American Championships in Tulsa. There he was soundly beaten by Virginia's Thai Kwiatkowski 6-0, 6-2, unable to keep the ball in the court with any consistency. He had the opposite experience in Sunday's final, racing out to a 5-0 lead over Goransson, while playing near flawless tennis. Goransson, whose defense had been so stellar against Chris Eubanks in the semifinal, did not seem as comfortable against Koepfer, who has similar power, and the first set went quickly. Goransson, a junior from Sweden, regrouped in the second set and hung with the senior from Germany until 5-5, but at 30-40, Koepfer came up with a great forehand pass to get the only break of the second set and Koepfer served it out at love. "I did what I had to do to give myself the best chance to win," Koepfer told the ITA. "I went for my shots every point and started really well, which gave me a lot of confidence." Koepfer did not drop a set in his five wins over the past four days. 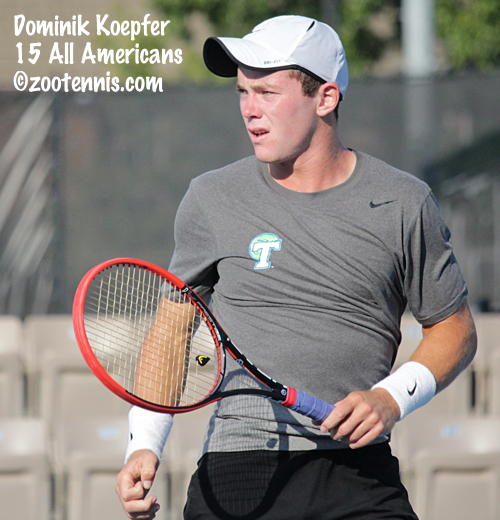 For more on Koepfer's title, see the Tulane website. The women's doubles title went to Hayley Carter and Whitney Kay of North Carolina. The No. 4 seeds defeated No. 3 seeds Mami Adachi and Aldila Sutjiadi of Kentucky 4-6, 6-4, 10-6. Texas Tech's Hugo Dojas and Felipe Soares delivered their program's first national title, winning the men's doubles championship with a 6-4, 5-7, 10-7 win over No. 2 seeds Brett Clark and Robert Kelly of North Carolina. Dojas and Soares, the 2015 NCAA finalists, were unseeded. In the consolation tournaments for losers in the first round, Florida State's Benjamin Lock defeated Dartmouth's Dovydas Sakinis 7-6 (4), 7-5 in the men's final. Klara Fabikova of Cal beat Brienne Minor of Michigan 6-2, 3-6, 6-1 in the women's consolation final. Stanford's Taylor Davidson and Caroline Doyle and Georgia's Ben Wagland and Austin Smith won the women's and men's doubles consolation finals. Complete draws can be found at the ITA tournament page. It was a disappointing day for young Americans in finals, with Louisa Chirico, Alex Rybakov and Frances Tiafoe all coming up short in their championship quests. Chirico lost to No. 3 seed Caroline Garcia of France 6-1, 6-3 at the $125,000 tournament in Limoges, Rybakov was beaten by top seed Bastian Trinker of Austria 6-1, 6-2 at the $10,000 Niceville Futures, and Tiafoe fell to Daniel Evans of Great Britain 5-7, 6-1, 6-3 in the $50,000 Knoxville Challenger final. Tiafoe was down 4-1 in the final set, got the break back for 3-4, but was broken in that game, and Evans served out the match at love. Tiafoe is now in second place in the USTA's Australian Open Wild Card Challenge, behind Noah Rubin. Both are playing in the third and final leg of the Challenger in Champaign next week, with Rubin receiving a wild card. I will be in Champaign for a day or two early in the week. Samantha Crawford's final with Viktorija Golubic of Switzerland was delayed over five hours due to rain in the Scottsdale area and after about an hour of play, rain returned, with Crawford leading 6-3, 2-3. If she wins the $50,000 title, whether later tonight, or on Monday, she will take the USTA's Australian Open wild card. Brian Cernoch and Caty McNally won the singles titles this weekend at the ITF Grade 4 at the Evert Academy in Boca Raton. 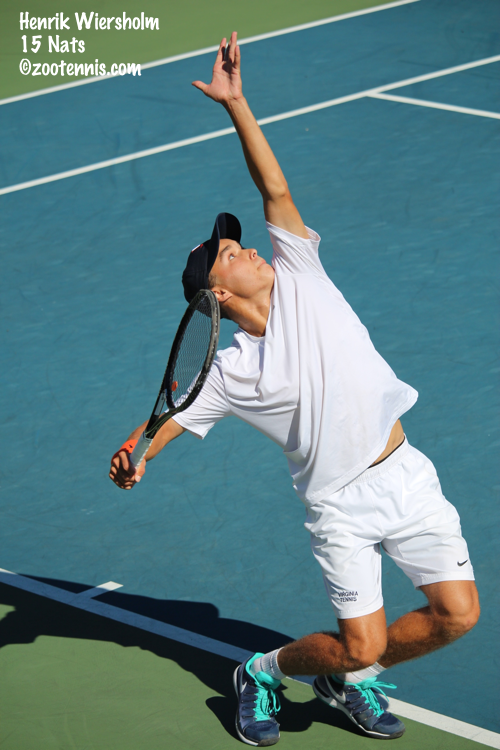 The 16-year-old Cernoch, seeded No. 12, defeated Lane Leschly, the No. 16 seed, 6-4 6-2 in the final. It was Cernoch's first ITF singles title. No. 4 seed McNally, who turns 14 next Friday, won her second ITF singles title, beating doubles partner Kacie Harvey 6-1, 6-0 in the final. McNally lost only ten games in her six victories, six of those in her 7-5, 6-1 quarterfinal win over top seed Hurricane Tyra Black. Ryan Goetz and Mac Kiger, the No. 7 seeds, defeated unseeded Leschly and Justin Lee 7-5, 6-2 for the boys doubles title. No. 7 seeds Emma Decoste and Clarissa Hand won the girls doubles, beating No. 5 seeds McNally and Harvey 6-1, 6-1 in the final. Eighteen-year-old freshman Francesca Di Lorenzo, who received a wild card into the USTA/ITA Indoor Intercollegiate Championships, defeated Miami senior Stephanie Wagner 6-4, 6-4 in Saturday semifinals to set up a meeting with another veteran, Joana Eidukonyte of Clemson in Sunday's final. Di Lorenzo won all four of the no-ad deciding points in the first set, using a blistering backhand to keep the hard-hitting German from moving into the court. Di Lorenzo maintained her focus in the second set, and again proved more consistently aggressive on the big points, taking a 5-3 lead and holding to love to close out the No. 8 seed. Eidukonyte had advanced in the previous match, defeating No. 7 seed Belinda Woolcock of Florida 6-4, 2-6, 6-3 in just under two-and-a-half hours. Ohio State has never had an Indoor finalist, while Clemson's Ani Mijacika twice made the final, in 2007 and 2008, losing both times to Arkansas' Aurelija Miseviciute. The men's final will have the only seeded player in either final, with No. 3 seed Dominik Koepfer of Tulane taking on unseeded Andre Goransson of Cal. Goransson used some outstanding defense to defeat Georgia Tech's Chris Eubanks 7-5, 1-6, 7-5. After 10 straight holds and no deciding points in the first set, Goransson broke at 5-5 then served out the first set. In the second set, Eubanks stepped up his game, which was impressive throughout with its sheer power, and went up a break in the third, but Goransson got the break right back. He continued to go all out in his efforts to get the big shots of Eubanks back in play and with Eubanks up 30-0 serving at 5-6 in the final game, Goransson used a new tactic. Twice he took returns early and moved forward, winning both points and then earned two match points when a Eubanks shot went just long. Eubanks saved the first match point with a forehand winner, but the deciding point went to Goransson when Eubanks netted a forehand after a rally. Koepfer defeated unseeded Joao Monteiro of Virginia Tech 6-4, 6-4 to make his second major final, having also reached the championship match of the ITA All-American last month. Tulane has had one Indoor finalist and Cal has had two, but whoever wins will be the first champion from their school. This is the first time since 2006 that an American has failed to reach the Indoor final. In 2006, UCLA's Benjamin Kohlloeffel defeated Ohio State's Steven Moneke in an all-German championship match. The men's doubles championship will be between No. 2 seeds Brett Clark and Robert Kelly of North Carolina and Hugo Dojas and Felipe Soares of Texas Tech. Kentucky's Mami Adachi and Aldila Sutjiadi, seeded No. 3, will take on No. 4 seeds Hayley Carter and Whitney Kay of North Carolina for the women's doubles title. All four semifinal matches were live streamed on ESPN 3, and are available for replay. The commentary team of Patrick McEnroe and Stephen Amritraj did an excellent job, with USTA National Collegiate Coach Amritraj's knowledge of the players a huge plus. The camera angle was not ideal, but that's a minor issue in the overall scheme of things and I'm very appreciative of being able to watch the matches on my computer. Tomorrow's finals begin at 10:00 am, with the women's final first, and the will also be live streamed at ESPN 3 or Watch ESPN. Complete results, including consolation results, can be found at the ITA tournament page. Frances Tiafoe reached his second Challenger final of the year and the first since Tallahassee this spring, defeating Dennis Novikov 6-4, 6-4 in this morning's semifinal in Knoxville. Tiafoe trailed 4-1 in the second set, but his backhand was particularly effective throughout the match and he seized the opportunities Novikov provided him late in the second set. A second straight all-US teen Challenger final was thwarted by Great Britain's Dan Evans, who defeated Jared Donaldson 6-3, 6-4 in the day's first semifinal. Alex Rybakov will play in his first Futures final on Sunday in Niceville, Florida after the 18-year-old TCU recruit defeated Andrew Carter 6-2, 6-1. Rybakov, who has yet to drop a set in the $10,000 event, will play top seed Bastian Trinker of Austria, who outlasted Jean-Yves Aubone 6-7(2), 6-3, 6-1. Samantha Crawford kept her hopes alive for an Australian Open wild card, saving a match point en route to beating No. 5 seed Rebecca Peterson of Sweden 4-6, 7-6(5), 7-6(2) in a match that lasted nearly three hours at the Scottsdale $50,000 tournament. The 20-year-old will face Viktorija Golubic of Switzerland, last week's winner in Waco, who defeated wild card Robin Anderson 6-3, 6-3. If Crawford wins the title, she will get the wild card, as current leaders Nicole Gibbs and Anna Tatishvili reached finals the past two weeks, but did not win. Nineteen-year-old Louisa Chirico will play in the biggest final of her career on Sunday in Limoges, a WTA $125,000 event. Chirico defeated Francesca Schiavone of Italy 6-3, 7-6(5) in the semifinals today, and will face No. 3 seed and WTA No. 35 Caroline Garcia of France in Sunday's final.